Renters looking for something that might qualify as a deal by Seattle standards are in luck as a record number of new apartments spring up. And with new housing openings scheduled to peak this spring and summer, there’s a consensus that rents won’t be budging much for a while. The average rent across the region that includes King and Snohomish counties did inch up a bit less than 1% from the winter to spring, as part of a normal seasonal pattern — although it was the smallest springtime increase since 2010, according to a new report from Apartment Insights/Real Data, which surveys landlords quarterly. Rents did dip slightly in the past quarter in some neighborhoods, including Ballard, Central/South Seattle and Queen Anne/Magnolia. Outside of the city, rents declined a bit from winter to spring in Burien, Mukilteo, South Everett, Federal Way, Lynnwood and Mountlake Terrace. At the same time, about 1 in 10 apartments across the city remain empty, and perks like a free month’s rent have become standard at most new buildings, and even some older ones. Compared to a year ago, rents across the region grew 4.7 percent, with the largest increases in low-cost areas getting the least apartment construction — South King County and north Snohomish County. Average rents across all unit types reached $1,940 in Seattle, $1,980 on the Eastside, $1,460 in South King County and $1,500 in Snohomish County. Part of the increase in Seattle is simply due to all the new, luxury units flooding the market and skewing the average rent higher. Apartmentlist.com, which controls for that by looking only at the actual rent changes at the same units, found renters in the city of Seattle who stayed put are paying just 0.5% more than a year ago, or less than inflation. Seattle’s rent growth ranked 559th highest out of about 820 cities tracked by the website, and lagged both the statewide and national averages. Renters who’ve seen new apartment buildings completely transform the city around them may be disappointed that rents remain among the highest in the country. But it’s also remarkable that rents have been essentially flat at a time when the city’s population, job base and incomes have been growing at among the fastest rates in the country. The Seattle metro area built 17,450 apartments in 2018 — 48 per day — the fourth most in the country for the third straight year, according to an analysis of census data. That beat the local record set the prior year, which in turn had surpassed the previous high from the suburban-driven apartment boom in the mid-’80s. Only the New York, Dallas and Los Angeles regions have built more apartments than Seattle in each of the last three years. But Seattle is building more than those regions on a per-capita basis. A few smaller metros, most notably Austin, Texas, and Orlando, Florida, built more than Seattle on a per-capita basis. 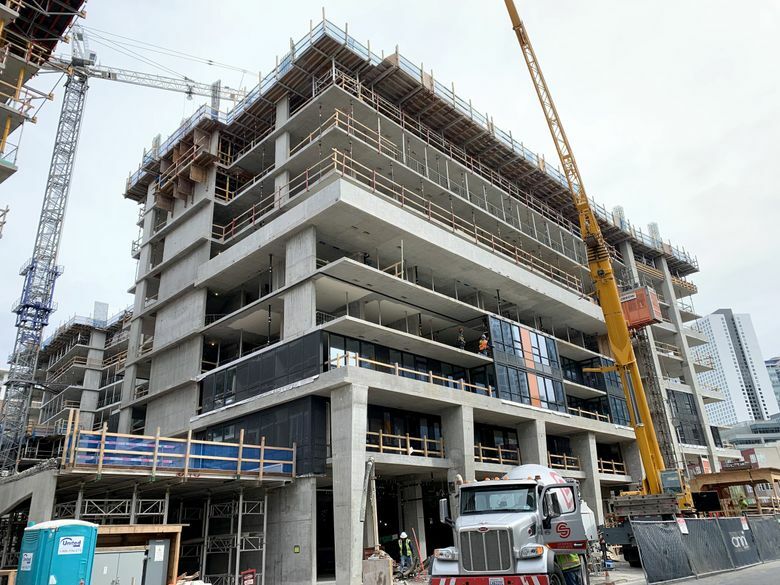 Based on construction underway now, the peak of the new apartment openings — about 9,000 units across the metro area — is scheduled for this spring and summer, just in time for the prime mover season, according to research by the national rental firm Yardi Matrix. 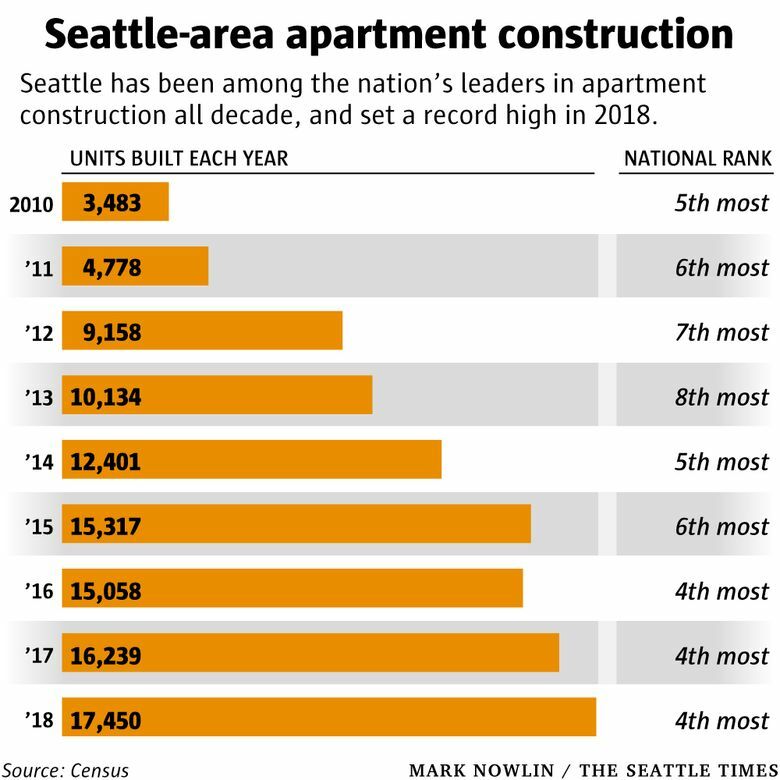 More of those units are going in the city of Seattle than the rest of the metro area combined. The City Council last month approved upzones in parts of 27 neighborhoods, which figures to spur even more apartment construction. The pipeline for future projects hasn’t changed much — still sitting at about 45,000 units across the region, according to Apartment Insights/Real Data. Not all of those will get built, however. Brad Reisinger, Pacific Northwest division president for Lennar Multifamily Communities, which is building several apartment projects in the region, said it’s getting harder to get funding to build projects now because costs for land and construction have gone up so much faster than rents. He said it’s getting close to the point where projects won’t work financially for investors. Reisinger said his firm is not forecasting any significant rent increases for the region for the next few years and is building because it believes in the region’s economy over the long term. Most firms are forecasting small, if any, rent growth for the next year. Zillow is predicting a slight drop in rents through 2020 for the city of Seattle, and a 2.5% increase for the full metro area. Gone are the days when builders could throw up identical apartment buildings — the type where small studios and one-bedrooms are joined by yoga rooms and a concierge — and watch them instantly fill up. In one new project on First Hill next to Town Hall, called Ovation, Lennar is looking to stand out by putting extra space in bedrooms and bathrooms — with room for a king-size bed, walk-in closets and dual-vanities — along with a rooftop pool and a kids play area. The Apartment Insights/RealData survey shows the biggest rent hikes were generally in farther-out, cheaper areas: Rents in the past year went up 17.6% in the far eastern part of Snohomish County, 9.6% in the Woodinville area, 8.9% in Burien and 7.5% in Tukwila. On a quarter-over-quarter basis, rents grew at least 2% in the Woodinville area, the Shoreline area, Sammamish-Issaquah, the far eastern part of Snohomish County and Tukwila. The most expensive rents are in downtown Seattle ($2,490 average across all unit types), West Bellevue ($2,280), South Lake Union ($2,150), Belltown ($2,090), the Newcastle area east of Mercer Island ($2,080), Sammamish-Issaquah ($2,060) and Capitol Hill ($2,010). The cheapest rents are in SeaTac ($1,280), Des Moines ($1,290), Central Everett ($1,370), Tukwila ($1,370), Federal Way ($1,380) and the Enumclaw area ($1,390). Overall, across the region that includes King and Snohomish counties, 8.5 percent of all apartments are empty; when excluding the new buildings, the vacancy figure drops to 5.3 percent. Both numbers are down just a hair from the prior quarter, when vacancy rates had hit their highest point since 2010. South Lake Union overtook downtown for the highest vacancy rate, with 17.2% of all apartments sitting empty, including new ones, followed by First Hill (16.8%) and Belltown (15.9%). As for construction, Redmond has 3,100 units getting built now, while Central/South Seattle has 2,400 and the downtown core has 2,100. The downtown core has the most units planned in the pipeline, with 9,500, followed by Central/South Seattle (8,200) and South Lake Union (5,400). Generally, most of South King County and north Snohomish County have had the fewest new apartments built.